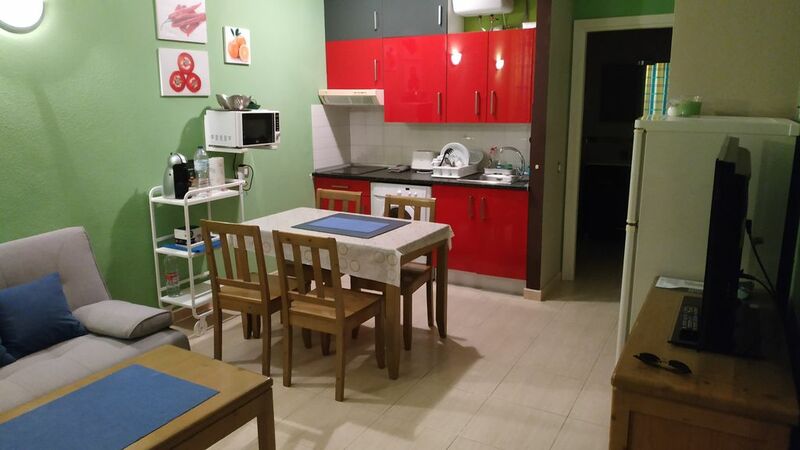 Apartamento con todas las comodidades en complejo tranquilo y privado. Dos terrazas y magníficas vistas. Parte alta sin vecinos encima. Terraza B: 2 Mesas y 4 sillas con reposabrazos. Tendedero. 2 hamacas de aluminio y tela. Cocina: nevera grande con congelador separado, microondas, placa vitrocerámica, cafetera eléctrica, exprimidor (zumos), calentador de agua eléctrico, tostadora, lavadora, DolceGusto by Nespresso. Dormitorio: 2 Camas, Armario, tocador, portamaletas, cortinas 100% oscuridad, mesita de noche con lámpara de lectura, cómoda 4 cajones, radiador eléctrico. Miguel's property was absolutely perfect for our stay. On the top floor of the building and not far from the roof top pool was wonderful. Importantly, there is a lift which was also always very efficient. The apartment was exactly as advertised with everything we needed to enjoy our stay in Taurito. As has been mentioned in other reviews, the welcome pack which Miguel left for us was very kind and very helpful after a long day travelling. All our communications with Miguel were perfect too from beginning to end. The area was very nice, with the mountain road to Puerto de Mogan still closed because of the landslide and not likely to be open again any time soon. We would recommend that a car is necessary to enjoy the island of Gran Canaria although the bus stops are very close by if you want to use the bus and also there is a very efficient taxi service nearby. We had a really lovely stay. We would go back again. And we would highly recommend Miguel's apartment without any hesitation. Thanks for your comments Karen. We are really happy if our guest are happy and spend lovely holidays. Abbiamo soggiornato a Taurito la settimana tra l'11 e il 18 marzo 2018 in questo grazioso e confortevole appartamento, con le sue bellissime terrazze con vista sulla baia e sulle montagne circostanti. L'appartamento è semplice ma completo di tutto, molto pulito e ha una cucina perfettamente attrezzata (dispone perfino di una utilissima lavatrice). Posteggio facile da trovare nelle vicinanze. Il "plus" è l'accoglienza gentile ma non invadente di Miguel, che ci ha fatto trovare uno speciale e dolce benvenuto al nostro arrivo di cui gli siamo molto grate. La spiaggia di Taurito non è la più bella della zona, meglio andare ad Amadores o a Tauro. La strada per Puerto de Mogan è momentaneamente interrotta per una frana e quindi è necessario prendere la superstrada (possibile solo verso Puerto Rico) e fare un giro più ampio per raggiungere quella località. Per noi è stato tutto perfetto e speriamo di poter ritornare presto. Grazie ancora, Miguel! We spent a week, within 11th and 18th March 2018, in this cozy and comfortable flat which has two wonderful terraces with a view on Taurito bay and the surrounding mountains. The flat is simple and very clean, it has a modern fully equipped kitchen (there is also a very useful washing machine). Parking is easy in the nearby. We really appreciated Miguel's kind and thoughtful (but not intrusive) hospitality and we were touched by the special and sweet welcome we found on our arrival, for which we are still very grateful. Thus Taurito beach cannot be considered the most beautiful beach in this area, in a few minutes you can reach the wonderful Amadores and Tauro beaches (they're worth a visit). The national route between Taurito and Puerto de Mogan is presently interrupted by a landslide, then it is necessary to make a longest ride (by highway, via Puerto Rico) to reach that resort. Finally, in our opinion always was perfect and we do hope to come back to Taurito in a not too distant future. Thanks again, Miguel! Grazie mille per il tuo commento e per la tua visita. È stato un vero piacere averti come mia supposizione e sono molto felice che tu possa goderti il tuo soggiorno a Gran Canaria. Thanks a lot for your comment and for your visit. It was a real pleasure having you as my guess and I am very happy you enjoy your stay in Gran Canaria. Apartment sehr sauber. Ein ganz tolles modernes geräumiges Bad. Es ist alles vorhanden, was man in einer FW braucht. Uns hat es sehr gut gefallen. Vor allem der fantastische Ausblick auf den Vulkanberg, das Meer und den unten liegenden Park mit Palmen Kakteen und blühenden Pflanzen ist schon ein Traum. Dadurch das beide Terrassen mit einer verglasten Brüstung ausgestattet sind, hat man den tollen Ausblick. Vielen Dank für Ihren Kommentar, wir schätzen Ihre Meinung sehr, die uns zweifellos helfen wird, uns zu verbessern. Es war wirklich ein Vergnügen, Sie in meiner Wohnung willkommen zu heißen und Sie konnten Taurito und unsere Insel Gran Canaria genießen, und wir hoffen, Sie wiederzusehen. Thank you for your comment, we greatly appreciate your opinion, which will with no doubt help us to improve everyday. It was really a pleasure to welcome you in my apartment and that you could enjoy Taurito and our island of Gran Canaria, and we hope to see you again. Sehr netter und hilfsbereiter Vermieter, aber das App. ist in jeder Hinsicht ausbaufähig! Thank you very much for your stay. Take note of your comments for making better all time. Hope to see you again.